Learn some skills to get you through some of the easier technical trails in the 1 Mile Zone. Work on technical climbing skills so you can pick better lines, negotiate corners and generally just staying on your bike! 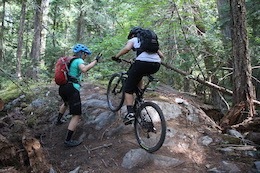 Then have more fun learning to descend technical trails like Fizzy Pop and DogBeach. Great for the lower intermediate rider who is not quite ready for the steeper Pioneer trail quite yet.